There is a plaque in Cowcaddens station which was originaly up at the Albion Street station. My uncle was killed in the fire. The 50th anniversary is next month & I hear there is a memorial tribute being arranged to mark it. I can't believe so many years have passed. I remember the Cheapside fire very well, my Wife's Cousin's Husband was a Fireman and he was awarded the George Medal for his actions at the fire his name is Jim Miller they lived at the Fireman's Residence near Avenuepark St..
My mum had been to a ladies meeting that night in Temple on leaving the hall they were watching the glow in the distance mum slipped and broke her ankle and had to wait till naxt day for treatment because the WESTERN was too busy. None of us knew at the time how bad and devastating the fire was. Just watched the 50th anniversary programme on BBC Scotland. What a terrible thing to have happened. These brave men deserve to be remembered. Before my time, but have often heard about this through the years. Have been reading everyones comments. My grandfather Fireman Christoher Boyle was killed in the Cheapside Street fire leaving a 5yr old(my dad), 3yr old girl, 1.5yr old boy and 3wk old baby girl. Was very emotional watching the programme on Sunday night thiking one of the coffins was my grandfather that I never got to meet. I am trying to find a picture of my grandfather in his fire brigade clothing to give to my dad as he doesnt have any photos but cant find any within the family. Tried contacting Glasow Fire Service but dont think they can help. Does anyone have any ideas? Hi Sharon, I hope you have some luck in getting the photo of your brave grandfather. You might want to try the local newspapers at the time as chances are they would have wanted to publish pictures of all the dead firemen. I have a photo of him walking towards the camera at the exact moment the explosion happened! He always said he heard someone call him but never found out who it was but it saved his life as most of his watch blew up and his fire engine ( he was the driver) Francis Holmes!!! What they dont say is tha t the surviving firemen had to dig their colleagues and friends out and ID them by what was left, ie wedding ring, st Christopher medal etc!!! it was horrific! We were moved from Imgram st to partick firesation and Dad was posted to Andreson then as there were no firemen left apart from Jimmy Dunlop I believee! Nice to see it remembered and honoured by the city last month though! Hi Sharon, My Dad was Freman Frank Holmes and I have phoros of him with his friends unfortunately they are in storage at the mo but I will look through them when I get them out as Chris Boyle was stationed at Cheapside st on the same watch as Dad I think... which fire station did he and his family live in do you know? 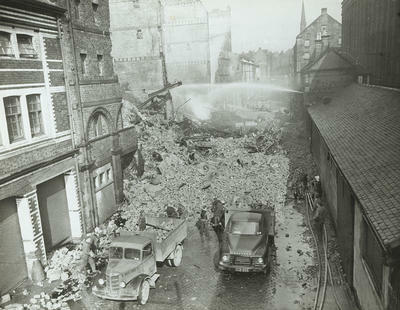 My Uncle was one of the fireman that survived the Cheapside street fire. Sadly there is not much information on those heroes that did survive. As someone mentioned the horrors their uncle endured digging out and identyfing there best friends. The first I found out about Cheapside was a visit to a GP who had been brought in out of retirement to cover staff shortage for the day. He asked about my unusual name and connection with relatives. Soon he was telling me my family history and about how fireman back then lived in firestations with their family. How my aunt had helped out counselling bereaved wifes. My father is 85 now and doesnt say much about it other than it was a terrible tragedy. My uncle had also been a prisoner of war captured by the Japaneese. My dad says that when my uncle was freed he would talk without moving his lips because to survive camps they couldnt be caught talking. At his funeral there was never any mention of any of this but several bus loads of people came to pay there respects at the church. I did see a photogragh a few years ago on the fire station website talking about Ingram st station. It had a photograph of my uncle with 5 firemen when he first joined in ??1940s. I think he was only 18 and nicknamed Dad Golby. 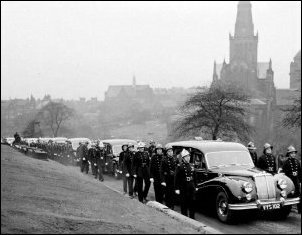 My dad had been an auxillary fireman, when we saw the fire from our house in Partick, my dad went down to the local fire station to see if he could assist in any way, he was told that the "profesionals " were handling it, as we stood and watched the flames my dad felt bad that he could do nothing to help.